Advantages: Interesting text with good historical and statistical synopsis; many relevant captioned wartime photos; inspirational profiles. "Barbarossa - The Invasion of Russia June-December 1941" sets the scene for the titanic struggle that was to follow for almost four years, and which sealed the fate of Eastern Europe for the subsequent half-century. This volume also provides some excellent background to the Luftwaffe's role in the early stages of the campaign. By Hitler's own orders, the Jagdwaffe was to concentrate on neutralising the Russian Air Force in the field for the tactical support of Wehrmacht operations. The Luftwaffe was expressly ordered not to attack the Soviet armaments industry at this stage of the campaign. The successes of German fighter units in the first weeks of the campaign were almost beyond belief. Aerial victories between June and December 1941 stood at more than 7,000. The only wrinkle was the slow re-supply and repair of lost and damaged aircraft. Although this did not delay the rapid German advance of the first few months, it had compounding and ultimately disastrous consequences as the year ended. Mombeek and Bergström's text is dished out in a series of easily digestible and logically organised fragments,\; separated by photos, profiles, tables and personal recollections. The result is a unique and attractive package. More than 200 wartime photos are usefully captioned and highly relevant to the subject matter. 25 profiles by Claes Sundin add real inspiration for the modeller. Claes' artwork is superb, with beautiful rendition of light and shade. He handles the random mottling of Luftwaffe fighters very convincingly too. The only curiosity about the profiles is the reference to 74/75 greys applied to the earliest Bf 109s used in Barbarossa. It is generally believed that these new greys were not introduced until later in 1941, although customised greys had been used on the Channel front for some months before. 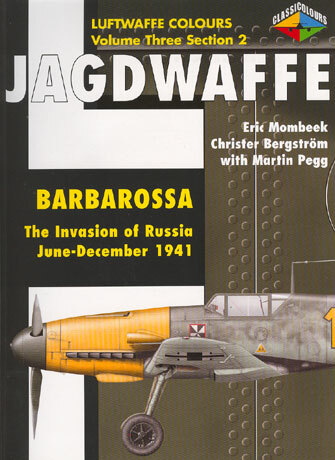 "Barbarossa - The Invasion of Russia June-December 1941" is an excellent summary of colours, markings and the context for Luftwaffe fighters in the first months of the invasion of Russia. The historical analysis is concise but interesting, and there is ample inspiration for modellers with profiles and photos between the large-format covers. This is another terrific instalment in Classic Publications Jagdwaffe series.